Pandawa Cliff Estate Villa Markisa is five bedrooms villa which is the newest of the Pandawa Estate properties, boasts the same spectacular cliff-top setting and ocean views as its neighbours, Villa Rose and The Pala. Pandawa Cliff Estate Villa Markisa will be especially appreciated by couples and families who enjoy holidaying together, but also treasure having their own private space. Beyond the main building, which houses the communal living and dining rooms, are a pair of matching two-bedroom units, each with its own pool. And hovering high above the ocean, at the front of Markisa’s generous lawn, is a splendid one-bedroom suite, again with its own pool, which lends itself beautifully to newlyweds. It’s hard to imagine a more romantic setting than this. Pandawa Cliff Estate Villa Markisa has been finished and furnished to the same impeccable standard as the other villas on the Pandawa Cliff Estate and shares a sports centre (with squash and tennis courts), spa and gym with them. 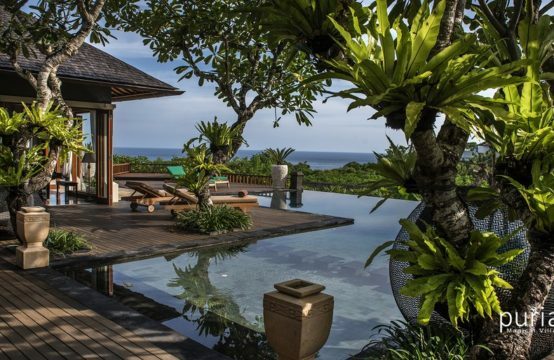 The exclusivity and scale of the estate – which can sleep up to 42 adult guests (plus several children in extra beds) has unsurprisingly made it one of Bali’s most sought-after destination wedding venues. The large, interconnecting estate grounds, complete with purpose-built facilities, can accommodate wedding for up to 400 guests. A friendly yet discreet team of butlers, housekeepers, gardeners, security and kitchen staff all work diligently under the experienced villa manager to take care of every guest requirement and two cars with drivers are on hand for those who wish to explore beyond the villa. All four air-conditioned guest bedrooms are furnished with split-king beds resting against upholstered batik headboards; each can be set up as a king or twins, giving added flexibility for different guest group configurations. Each bedroom has a seating area – whether a pair of high-backed Chinese chairs or a leather chaise longue – resting on the marble-edged teakwood floor. All enjoy enchanting ocean views; the upper-level rooms opening onto a glass-fronted balcony, and the two garden level bedrooms onto the pool decks. The ensuite bathrooms are equally generous in size, with walk-in wardrobes/dressing areas, twin basins on marble vanities, monsoon shower enclosures, and statement bathtubs. One of the many attractions of Villa Markisa is the choice of communal and private living areas. On the upper level of the guest pavilion are two interconnecting air-conditioned living rooms, each with chic designer furniture — comfortably upholstered L-shaped sofa and leather-seated chairs set around a stylish coffee table facing a 43-inch satellite channel TV. Stairs from both rooms lead down to the dining rooms, each furnished with a glass-topped dining table comfortably seating six and a pair of high stools set before the bar counter separating a small kitchen with fridge. (There’s a professional kitchen just behind the villa, fitted with everything required to prepare feasts for guests.) On both levels, the huge doors separating the living and dining areas can be closed off for privacy or retracted for sociable living. There is also a private living room in the master suite, where a gilded Chinese engagement bed takes centre-stage. Other amenities here include a dining table for four, a butler’s pantry and guest washroom. Location at Kutuh village, The Bukit Peninsula, South Kuta, Bali, Indonesia. 3 pools: 9 x 4 m; 9 x 4 m; 6.8 x 4.4m.